I've spent much of the last fifteen years working on problems related to interoperability, portability and longevity of data, and in particular metadata in a library context. During these years I've been working a lot with XML. Early on I evangelized about XML with the fervour of a taleban. I suppose that I contributed to the four or five years of XML hype that started at the turn of the century and culminated 2004 - 2005 (cf. Figure 1, and Edd Dumbill's How Do I Hate Thee?). Since then I've become more moderate, but still embrace XML as the preferred tool for the modeling of data. Figure 1. 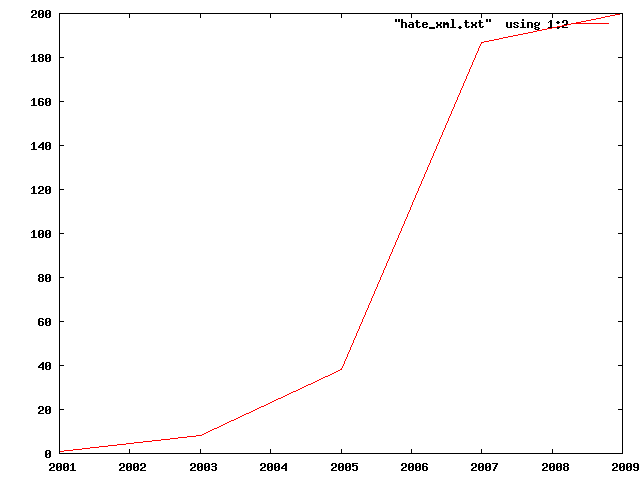 The number of web pages appearing per year containing the phrase hate XML . There is a steep increase in occurrence a few year after the Applied XML Developer's Conference 2004. After that it seems to level off. The data points represents hits pooled for two year periods graphed against the first of January the second year in each period. Because of the way Google works, the date searches mostly hits blog entries and other syndicated material, where publication date and other metadata are known. The earliest occurrence is from 2001. Once you have grasped a technology you cannot keep up strong emotions, at least not positive ones. You see both the shortcomings and the advantages. Possibly you can become more negative as time goes by. Or that is my personal experience. I think that our relations to our technologies is a bit like human relations. There is an early period when you fall in love. Then if you're lucky there is a long period of friendship and love of another deeper kind that may last much longer. Already year 2000 a friend of mine described his relation to XML as angle bracket fatigue , which I suppose is to be understood as I hate typing XML, since its syntax is just terrible . Figure 2. Search interest in Google for the term hate XML . 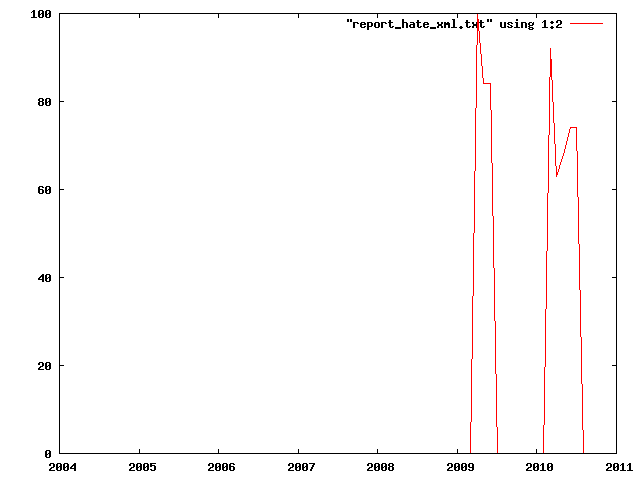 There are hardly any connection between the change in occurrence of the hate XML -emotions and search interest. People seem search for the term a few years after they wrote about it. Chris’s big beef with XML is that XML must be processed in isolation, using special purpose tools and languages such as XSLT. In order to use these special things, developers must become domain experts [my emphasis] in a rich and complex space that is essentially unrelated to the application itself. I think Chris (and Jeff) points out something important here. Many developers are interested in programming and computing, but not necessarily application areas. To parse and make something meaningful out of, say, bibliographical records or encoded text requires that you are actually interested in those areas. The same is true for fluid mechanics and natural language processing. Interest in partial differential equations and linguistics, respectively, will help. I cannot see any difference here between XML and SQL in this respect. Any tools for object-relational modeling is subject to the same problems. The developers that do the modeling has to become domain experts. This is fairly obvious for XML and less so for SQL. While few people form large scale standardization efforts for XML schemas, they hardly do so for RDBMS Schemas. What XML technologies provide that RDBMSs don't is an interoperable transfer syntax. Which I suppose is the reason why most XML in the world is stored in, well, RDBMSs. I cannot recall that I've ever written somewhere that I hate someone or even something. I feel that hatred is emotional and irrational. It may be a difference between languages and cultures, though; it can also be a question of semantic inflation. When we Scandinavians say that we hate something, we mean it. I'm not sure that that's the case in the Anglo-American sphere, and I'm not even certain that's the case for young Scandinavians. However, when you're a middle-aged academic and intellectual, you may not think it's appropriate to hate. Or, at least, you may not think that it's appropriate to describe your dislikes and annoyances as hatred. I have tried, a lot, to find out what people think about technologies such as XML, SQL, noSQL etc. Here both love and hatred are used as code words. People hate (or love) XML the same way they love (or hate) bebop, pop or hip hop music. Not the way they love their children, wife or mother. This entry (Do you hate XML?) within Sigfrid Lundberg's Stuff, by Sigfrid Lundberg is licensed under a Creative Commons Attribution-ShareAlike 3.0 Unported License.